A wealthy peaceful nation has been invaded by greedy forces who wish to gain control and power. Your mission as a K-C 139 ground support fighter pilot is to clear and prepare the battlefield for your tank invasion. Your skill as a fighter pilot and intelligence as a strategic military planner must be highly tuned and trained to complete this one of a kind game. Your plane is equipped with missiles and with a cargo hook. Use your missiles to counter attack enemy planes, helicopters, ground missile launchers and many other militant attackers. Use your cargo hook to pick up obstacles that are blocking your tanks path, then relocate the obstacles to places that will help your tank forces advance. As you advance forward allied forces may come to your assistance, welcome their support. Like in real life accuracy and timing are key factors to succeed. You must successfully complete ten separate air to ground battle phases in order to accomplish your mission and return the occupied territory back to its rightful owners. Two Go! Go! 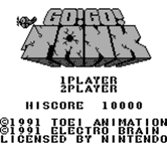 Tank's, two Game Boy's, a link and a friend can double your challenge and fun! "Good luck on your mission."